If Friday's ruling by the US International Trade Commission is not overturned, the US may ban imports of some HTC phones. 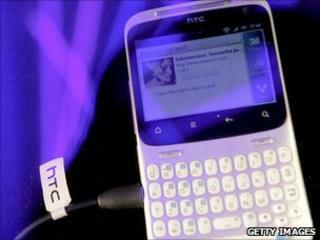 HTC and Apple are rivals in the smartphone market and analysts said the ruling may have industry-wide implications. Shares in HTC fell as much as 7% on Monday following the news. The US trade commission said that HTC was guilty of violating two Apple patents when it produced mobile phones based on the Android operating system. Apple had filed a complaint against HTC for infringing ten of their patents. However, the findings are preliminary and are subject to review by the full six-member committee in Washington. A final decision is due on 6 December. HTC said that it was confident it had a strong case for appeal, and maintains that it has not violated any of the patents mentioned in the case. This is the latest move in a longer running battle between Apple and HTC. Last year, HTC filed a complaint with the trade commission claiming that Apple was infringing its patents. The Taiwanese company is not the only firm wrestling with Apple over the rights to technology, with the US firm also in disputes with South Korea's Samsung and US-based Motorola. The announcement by the US International Trade Commission came late on Friday, and in an effort to boost its share price HTC said over the weekend that it would buy back some of its listed equity. HTC plans to snap up as much as 2.4% of the listed shares, about 20 million shares, at between 900 Taiwanese dollars and 1,100 Taiwanese dollars per share. Half of the repurchased shares will be transferred to the firm's employees and the remaining half cancelled. In early afternoon trading on Monday, HTC shares were trading at close to T$871.